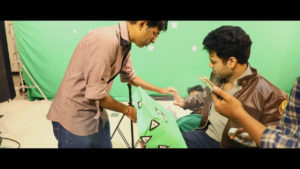 Hello, readers in today’s blog you will discover behind the scene of VFX Short film re-created by students of MAAC Chowringhee. Here aspirants and readers will get to know about different steps involved in re-creating 24 FPS VFX Challenge 2018 short film based on original film Star War: The Last Jedi. Star War: The Last Jedi is American space Opera film written and directed by Rian Johnson made in 2017. Our MAAC Chowringhee students have selected few shots from the Original film of Star War: The Last Jedi and recreated those shots using techniques like Chroma Key and different Visual effects and Animation techniques. 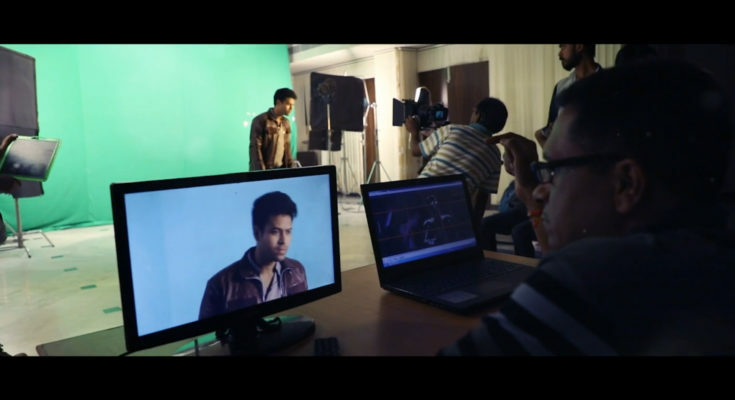 Let us look at the VFX short film made by the team The Backbenchers’. Set designing and Shooting is the integral part of Production Stage. In the above picture we can see the technicians helping out in applying pointers all over the Green screen for the effect of Chroma-Key. This was the first shot or image selected by our MAAC students to be re-created. In the above picture we can see a humanoid C-3PO robot and one of our students. In the original shot actor Oscar Isaac Hernandez Estrada was there with the humanoid robot C-3PO. 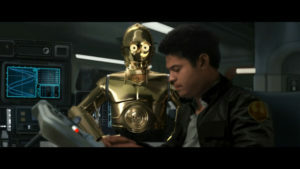 The first shot shows actor Oscar Isaac Hernandez Estrada talking to the humanoid robot C-3PO and the in the second image actor in working on this monitor. Shooting with camera requires lot of technical features like balancing the camera on the Tripod, checking recording mode, white balance etc. Here we can see how the team is working on capturing the shot. Three-point Lighting is crucial part of the shooting stage in the studio set up. 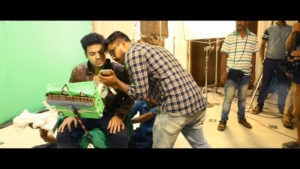 Here our student is getting a view of how he should act in front of the camera when the camera will start rolling. With reflectors at the back and properly lit set, team The Backbenchers’ captured the first shot. 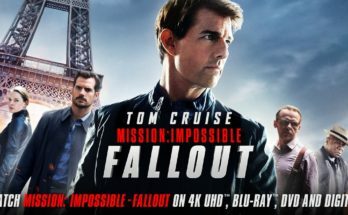 Instead of the actor Oscar Isaac Hernandez Estrada, one of our students with same dress code (brown jacket with logo) was inserted with in the shot. 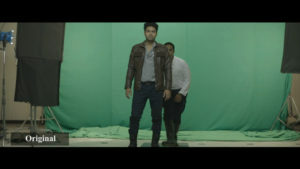 MAAC Students used Chroma Key Visual Effects technique to remove the background from the shot, this technique is used in post-production stage. Chroma Key helps in layering of two images together based on colour range. 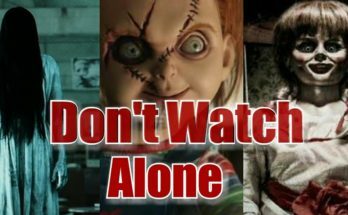 C 3PO or Humanoid robot was Modeled in 3D software then Texture was added to the perfection and the movement was given to the robot through Camera Tracking and Animation so that the robot can move and talk with the student within the shot. 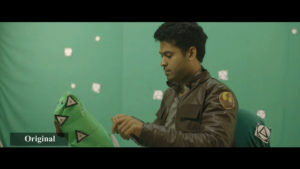 The team made lot of adjustment in the student character such as skin tone and hair was modified to match it with actor Oscar Isaac Hernandez Estrada. At the post production stage, with the help of techniques such as Background Paint, Motion Graphics, Adding C 3PO, Adding monitor, adding MAAC student as character, Wraping, Edge Light and Shadow and adding Grains the first two shot was recreated. Shot of Actor Adam Driver was recreated by adding another student model. In the film Star War: The Last Jedi actor Adam appears with a Lightsaber in the fighting scene with Mark Hamill. Our student model with similar hair and dress style of actor Adam was added into the new shot. In the next shot actress Daisy Jazz Isobel Ridley was replaced by one of our female MAAC students. 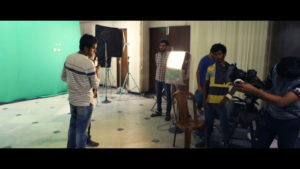 With the similar dress code and make-up the female student stand out in front of the camera with Green screen at the background. On the editing stage the Skin colour and Dress colour of the student character was adjusted, then the green screen background was removed. The team re-created the shot by adding Background Paint, Stone, Light, Debrish, Character, Glow, Rainbow and Grains. With all the CG effects the shot of moving stones all around actress Daisy Jazz Isobel Ridley was replaced by our female student model. CG dust and debris were added. To re-create the shot in which actor John Boyega and actor Oscar Isaac Hernandez Estrada is coming out of the rock cave, students worked on VFX and modeling. Stones were modelled using 3D software and then proper shapes, colours and textures were added into the stones. Stones were created by adjusting polygon and vertex in 3D software. Through Camera Tracking and Animation movements were given to the stones. 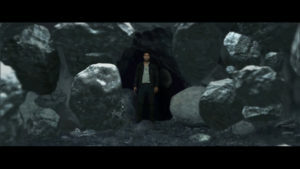 Background green screen was removed with the CG shot of cave, Student as character was added, Shadow, rocks and debris were also added. Each and every piece of stones were scaled, adjusted and animated to match the original. 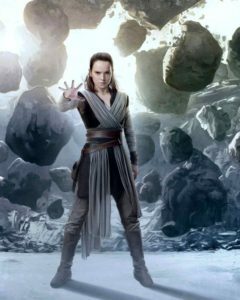 The above picture is re-created shot of actor John Boyega and actor Oscar Isaac Hernandez Estrada coming out of the cave with moving rocks all around. For the bullet firing weapon shot the team Backbenchers’ prepared the fresh model of the weapon in the 3D modelling software. Weapon’s height, diameter, length and weight were all matched with the original one. Artist worked on each single piece of the weapon, each part were created and fitted together, colour, shade and texture were adjusted. 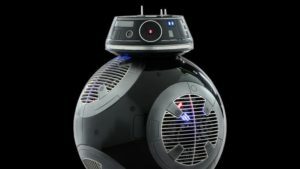 Team The Backbenchers’ also worked on the droid model of BB 9E which is an evil twin of BB 8 in the original movie of Star War: The Last Jedi. They first created the model or shape of BB 9E in the modelling software by adjusting polygons and vertex and then added texture and Lighting to BB 9E. Then the artists added the Computer generated duplicate background, object, Glow, Shadow and Grains to the shot. That is how students of MAAC Chowringhee centre created their short film 24 FPS VFX Challenge 2018 based on the original movie of Star War: The Last Jedi. 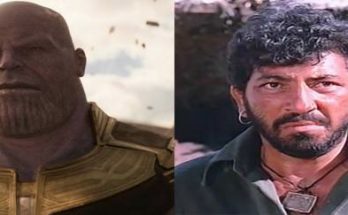 So, readers if you are willing to know more about the VFX techniques that can be used to recreate any Movie shot, then just visit our place and get the best training on VFX courses. Click Here And Register Yourself.